Straight Eagle Scout Returns Badges In Protest of Boy Scouts' Anti-Gay Policies - SEND THEM BACK! 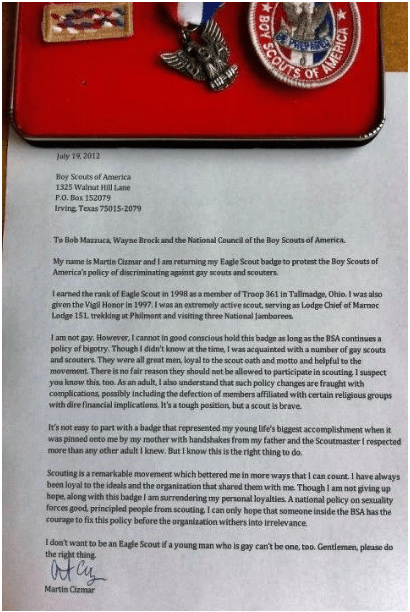 Home/Entertainment/Straight Eagle Scout Returns Badges In Protest of Boy Scouts’ Anti-Gay Policies – SEND THEM BACK! Straight Eagle Scout Returns Badges In Protest of Boy Scouts’ Anti-Gay Policies – SEND THEM BACK! Martin Cizmar a former Eagle Scout who’ currently the arts and culture editor of Portland Oregon’s weekly Williamette Week, returned his Eagle Scout badge and medals to the Boy Scouts of America yesterday in protest of the group’s anti-gay policies. Obviously the teachings of being an Eagle Scout prevailed in your life and made an impact in spite of the bigotry that is held by those who have the powers that be in the BSA. If you were a Cub Scout, Webloe or Boy Scout send back to the Boy Scouts of America and and all of your old badges, equipment, uniforms, handbooks, what ever you have in protest. THE BOY SCOUTS OF AMERICA’S BIGOTRY MUST BE STOOD UP TO AND STOPPED! Thank you Will. I love that you are becoming much more of an activist. I admire you tremendously. Keep up the good work. Ms. Lindsey Graham: Obama Needs To Act On ISIS Before They Kill Every American At Home!